The topic came up in one of my conversations today about the underrepresentation of protagonists of color in the YA literature being published here in the west. You may debate this all you like, if you want to. 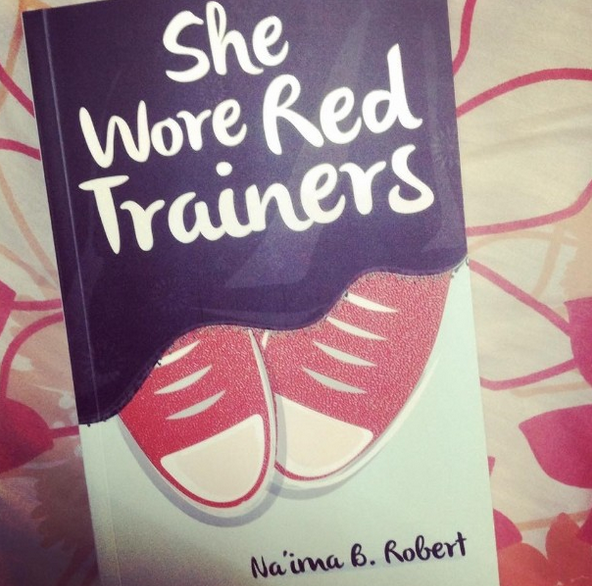 I know where I stand, and so I’m happy to feature this response by Iqra Asad to Na’ima B. Robert’s She Wore Red Trainers. Growing up reading classics, Enid Blyton and Roald Dahl, I never knew until my mid-teens that mainstream books in English featuring Muslim characters even existed. Of course, I knew about the angsty South Asian novel with the usual conflict of East versus West. In my opinion, those books, featuring characters that either live Western lives in an Eastern setting, or a Hollywood plot with Pakistani setbacks, were in the same line as photographers who only show the “starving Pakistani beggar” pictures in their portfolio. I mean to say that they only show to the global audience what that audience expects to see. Not to say that the starving beggars of Pakistan don’t have a story that deserves to be told, but National Geographic, Reader’s Digest and other leading publications are already doing that. What about privileged, middle-class, educated me who lives a life outside the “angsty Pakistani novel” experience? I like what the Indian author Uma Krishnaswami said about Kipling still being considered representative of the West’s perspective of life in India. Similarly, these novels by Muslim authors with Muslim characters, while entertaining and thought-provoking to read, are not as relevant to me as my more recent discoveries in the world of Muslim novels. I am aware that not every reader of She Wore Red Trainers walks away with the same fondness for it that I have. Every reader brings their own personal viewpoint with them to the reading experience, and mine was that of a twentysomething-but-still-reading-YA girl thrilled to read a woman writer writing about Muslim teens. How romantic is this “YA romance”? The story is boy-meets-girl and happily-ever-after, but there’s a lot of “looking away so as not to stare immodestly” and “keeping away because premarital relationships are not Islamic” in the book. As one Goodreads review stated, it doesn’t feature the frequent and in-depth personal interaction between the hero and heroine as most romances do. However, in my opinion I think that is keeping it real as far as the context is concerned. As a girl who had to shake her head numerous times when asked by her American health care provider whether she had had any sexual partner (No? Really? Not ever? OK, then), I understood the “attracted from a distance” theme of the book. To answer the question, it’s as clean as clean gets. Sterile, even. Also, it’s not really categorized by Amazon as a romance. It’s categorized under “family”. That should clear things up for you. However, to hook the youthful target readership, “halal romance” (“halal” being “Islamically permissible”) is the label to use. Trust me, we veiled Muslim girls really get a kick out of stuff like this. I think our main occupation really is “dreaming of marriage land.” There, I said it. People who know me as the reserved veiled bookworm can officially faint with shock now. If the blurb appeals to you, read it. If you’re curious, read it. If you want to support this particular niche, I insist you buy it. The ending is very fairytale and a tad unrealistic, but I accepted it, being an enthusiastic reader. Is it a valuable contribution to the women writers’ narrative? Yes, of course! As a female reader I want to read women writers writing about women, men, teens and toddlers going through all situations of this world. YA has a special place in my heart and seeing women writers thrive while writing YA really gives me a boost, both as a reader and as a writer. Have you read it? Would you like to read it? Does this article remind you of a book you’d like to mention? Do share in the comments. Iqra Asad is an American Pakistani, fresh out of dental school and writing her way forward in life. She blogs at http://iqrawrites.com/ and tweets as @iqrawrites.